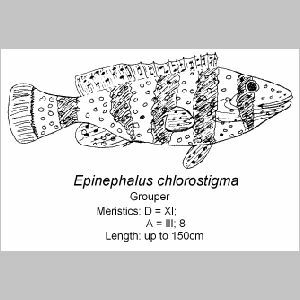 In this continuation of articles on fish found locally, we take a look here at two further species: Epinephelus chlorostigma and Gymnothorax meleagris. Known locally as Hamour, the common English name is Brown Spotted Reef Cod. This is one of the largest coral dwelling fish to be found in and around the Gulf. 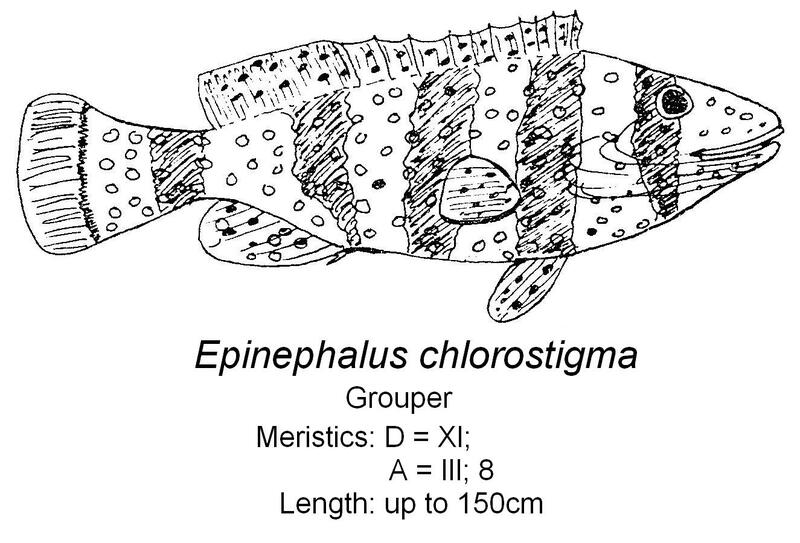 E. chlorostigma is one of the Grouper family. Description: E. chlorostigma has a pale green gray body covered with small circular brown blotches, except for its belly which is lighter in color. When aroused, the fish is able to change its body shading according to its surroundings. Five dark brown vertical bands appear along the body. Its mouth is very large and capable of being opened to the width of the body diameter. E. chlorostigma has large pectoral and caudal fins that enable it to move and maneuver quickly through the water. Habits and Habitat: E. chlorostigma is a reef-dwelling fish. It prefers coral caves or rock crevices in which to live, and feeds on crabs, cuttle fish and almost any other small fish. It is shy and lazy in its habits. When feeding, E. chlorostigma hides in its cave opening or in between corals and waits for some unsuspecting prey to pass by close enough to be pounced upon and swallowed whole. Predators are usually warned off by an impressive display of mouth gaping. E. chlorostigma has been observed throughout the Gulf and is prevalent in coral areas of the Batin Deep Channel off Abu Dhabi Island. 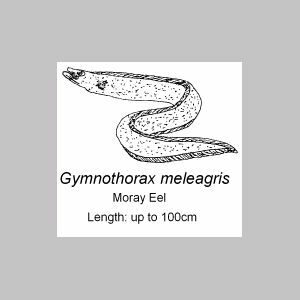 It is here that specimens up to 150 cm in length have been observed during snorkel swimming activities. 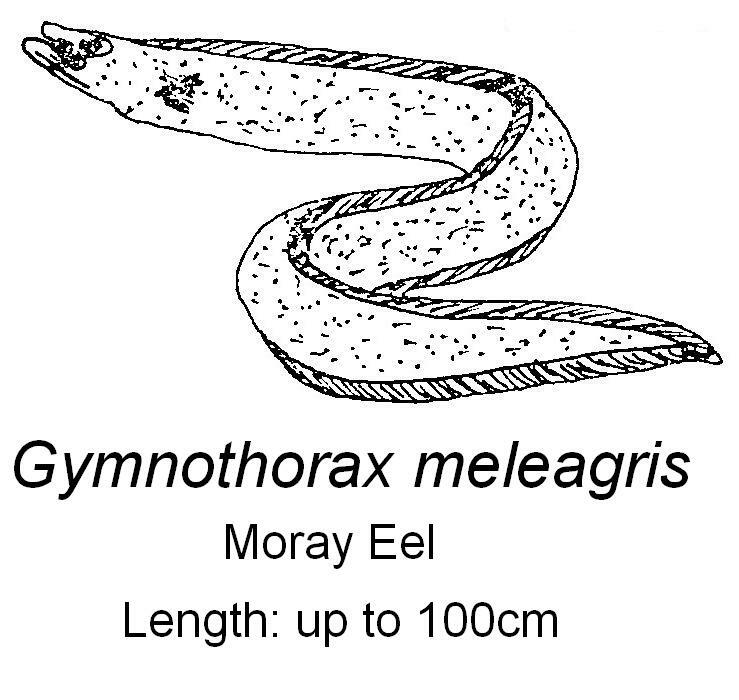 Commonly known as the Speckled Moray Eel, or Nakhoot in Arabic, G. meleagris is, in fact, more of a fish than an eel. True eels are air breathers but the Moray draws its oxygen from seawater, through tiny gills in the same manner as fish do. Description: G. meleagris has a black body with small yellow spots. Its eyes are above the mouth, which is usually kept open for breathing, thus displaying its sharp teeth. A Moray Eel can inflict severe bites if handled carelessly. The gill openings are black and situated one on each side of the body just behind the head. These eels can grow to a length of 100 cm. Habits and Habitat: G. meleagris spends most of its time under rocks or corals, where it burrows a suitable nest out of the sand using its tail as a shovel. It is generally a nocturnal feeder but can occasionally be seen during the daytime, especially if there are scraps of food about. They are often found inside lobster pots and fishing traps, the other occupants having been eaten or badly mutilated. Specimens of G. meleagris have been observed around the coral reefs off Khor Fakkan. They seldom attack humans, unless provoked.